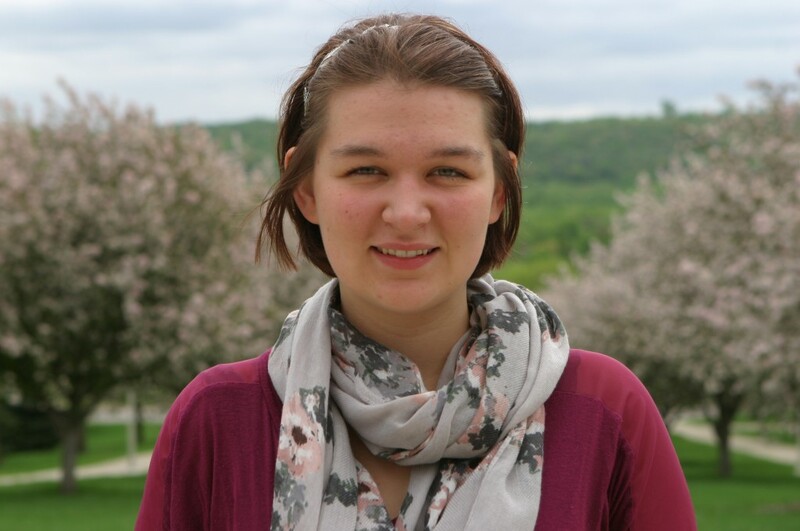 Editor’s note: Laurel Boman ’14 is a member of the Gustavus Wind Orchestra and is section leader of the saxophone section. 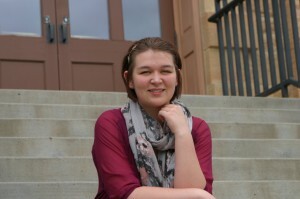 She is also plays lead alto in the Gustavus Saxophone Quartet. Gustavus senior Laurel Boman works with Associate Professor of Classics Eric Dugdale (Photo by Matt Thomas ’00). 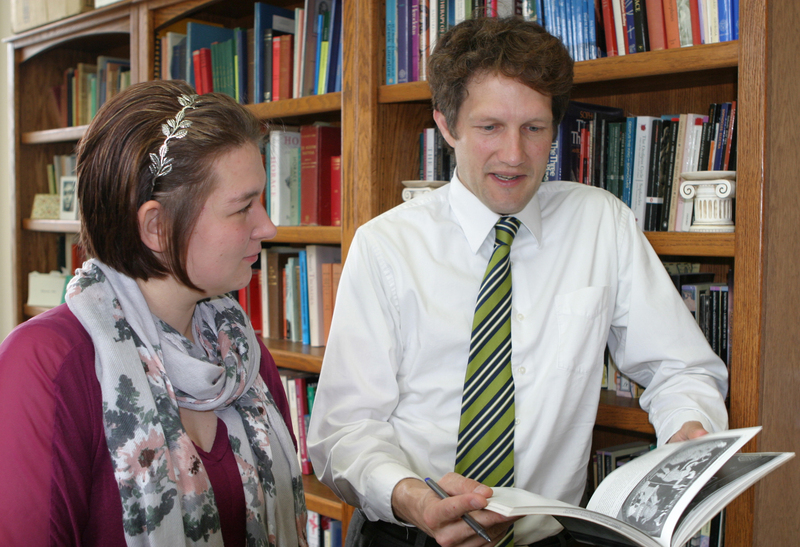 Students at Gustavus Adolphus College have many opportunities to excel and be rewarded for their hard work. Laurel Boman ’14 is one such student who has made the most of those possibilities and has recently been awarded with the Manson A. Stewart Scholarship as a result. This year the Classics Association of the Middle West and South awarded seven individuals within the region with this prestigious scholarship. The award is reserved for outstanding young classicists in their sophomore or junior year of an undergraduate degree. The application process begins when a student is nominated by the campus classics department, after which Boman completed her application and an essay component. The essence of the essay was to comment on the value of classics as a utilitarian discipline; essentially, Boman was asked to defend her major. Much of the major is focused on finding the points of connection with the Greco Roman world that are much like our modern civilization but also different in many ways. “My studies allow me to have a greater understanding of the human experience and to see my own humanity in ways that are unique to the discipline,” Boman exclaimed. “Laurel is a remarkable young scholar. She has intellectual curiosity, acumen, and the tenacity to delve deeply into a topic — a winning combination,” Dugdale said. Inviting and accepting challenges is something that faculty members, including Dugdale, have seen Boman do since she stepped foot on the Gustavus campus. With the dedicated and fabulous professors, the assortment of courses, and the basic foundations of the major, Boman has made the most of her studies in the classics department and feels rewarded by more than just the Manson A. Stewart Scholarship. Although the scholarship was truly an honor to win, Boman feels just as grateful for her time spent within a department that is so clearly one of the many wonderful opportunities for students at Gustavus. Laurel Boman is a native of St. Paul, Minn. She has been selected for induction into the Guild of St. Lucia and was accepted to study in India next fall on the India: Social Justice, Peace and Development semester abroad.